Earlier this year I moved to Italy with my boyfriend, Manuel, who comes from Lombardy, an area in the North. We had been backpacking around Indonesia and Asia and were ready for a more permanent abode. With the lure of reliable weather and amazing cuisine, how could I resist! 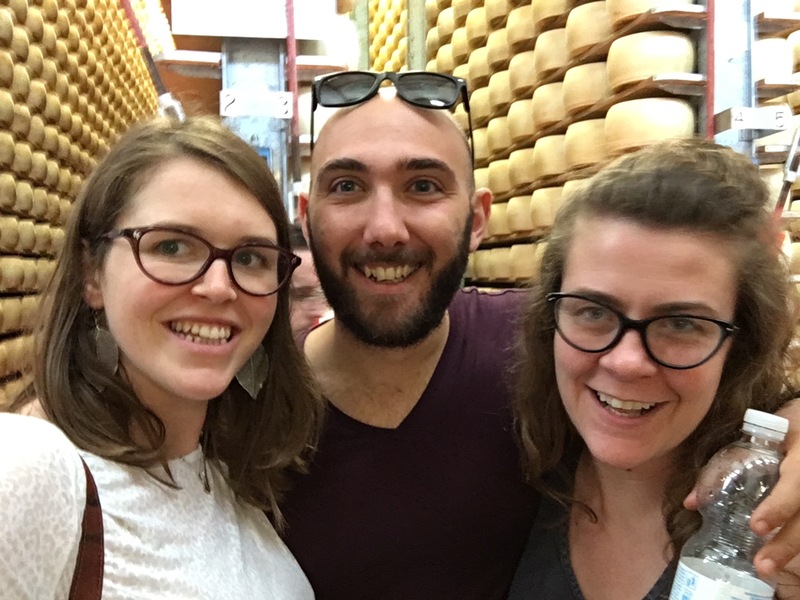 We had made it our mission to explore more of his fantastic country with our tastebuds as our guide, and so when my bestest, lifelong buddy, Sophs came to stay I knew it was the perfect time for a little trip to Reggio Emilia. A few weeks earlier, I had been getting a little bit cheesed off as I searched through multiple expensive tours of Reggio Emilia’s famous cuisine. 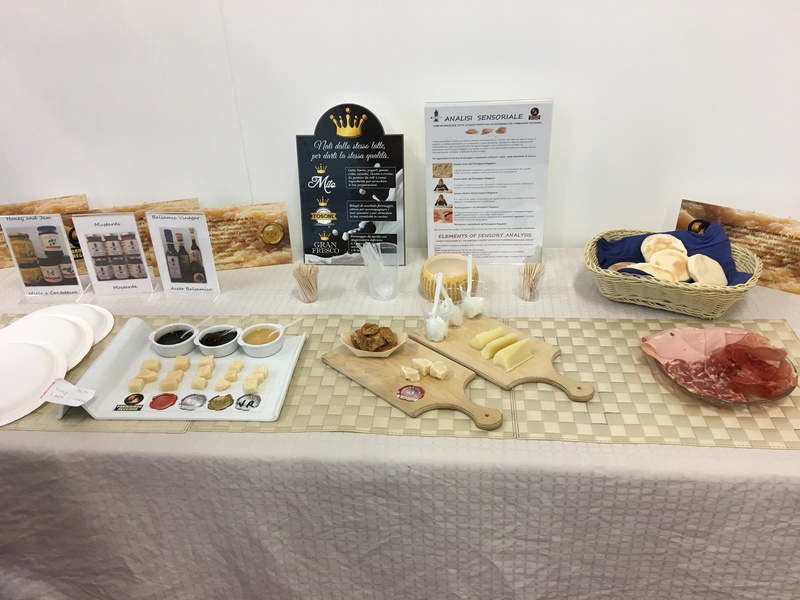 The area is best know for it’s unique brand of parmesan cheese (not all parmesan is created equal) but also with the city of Parma to the North West and Modena to the South East, Prosciutto (Parma ham) and Balsamico (vinegar) are high up the list of local delicacies. I wanted the full package that included all three foods, and had read some great reviews about Discover with Laura who offers a range of different trips that seem of the best value. If you don’t have your own car and want to pack everything into one day I’d reach out to her. However I’d also read somewhere in the depths of some forum that it was possible to visit the factory and have a tour without a guide. Obviously the local tour providers don’t want you to know this. I asked Michelle from Guide Parma if it was possible to visit the factories without a guide, explaining we had our own car and a small budget that wouldn’t stretch to her quote of €230 for 3 people ?. She replied, “It is necessary to pay a ticket which includes entry fee and tasting and the producers do not want to have people moving around without a guide!” What tosh and nonsense! Yes you need to pay a fee and to book ahead but the factories have their own guides and are more than happy to show you around for a LOT LESS money (more info below). I canned the idea of trying to squeeze Parmigiano Reggiano, balsamico and prosciutto into one day and decided I’d go DIY on the cheese factory. 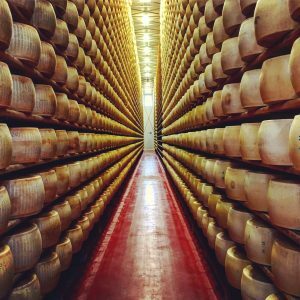 I found a list of all the official Parmigiano Reggiano factories which frustratingly I can’t re-find to share with you (maybe I just searched Google Maps?) but we visited Caseificio 4 Madonne, which I’d definitely recommend. We were in a group of about 20-25 people which I imagine is as large as it gets – it was after all a Saturday in July. With a view of the mixing room we were told how a combination of the previous day’s skimmed milk and current day’s full fat milk is put into huge coper vats. Heating and mixing processes turn it from liquid to a soft curd and a master cheese expert tests it by hand to determine if it’s ready for the next stage. It’s drained in huge muslin sacks and moved next door to be put in mounds. The sacks of soft cheese are put into plastic moulds and turned twice a day, for four days, to drain excess liquid and begin the shaping process. During this stage each cheese wheel is branded with the authentication marks and the date it was made. After this, it’s moved to a metal mould and submerged in a salt saturated solution which slowly starts to permeate the cheese. The giant wheels are then stored on shelves and left to mature from 12 to 45 months! The older the cheese the stronger the flavour and drier the texture. This room was incredible; for the Harry Potter fans out there, this was like a cheese version of the Hall of Prophecies. If you’re interested in knowing more detail about the making process I found this wikipedia page to be fairly accurate to what we were told on the tour. After the tour – which was given in both Italian and English – we were taken to a room for the tasting. The tour guide briefly informed us of what was included in the spread and left us to it. We had opted for the full shebang so we had different ages of Parmigiano Reggiano, a pot of ricotta, some tasty condiments – thick local balsamic, a chutney and a honey – a plate of meats including prosciutto, some flat bread and a sort of dried pork belly / crackling thing that was delicious. Oh and some fizzy red wine which is a thing here in Italy but I’m not sure I like it. I’ll have to keep trying until I know for certain ? The basic tour and tasting was €5 but for a little extra you could have what we had. I paid €15 each for my friend and I, plus €10 for a veggie version (same but minus the meats). If you’re visiting Italy for a holiday, you want to be looked after and you have the budget I expect the tours, whilst pricier, are a good option. The bigger your group the better the deal you’ll get. However if you have your own form of transport, are looking to for a cheaper alternative and are happy to spend a little more time organising things for yourself I’d say go for it! I spent a lot of time digging through websites, forums and occasionally trying to translate Italian (!) and so hopefully the below info will be helpful to you. I did so much searching to find the factory we visited that I can’t for the life of me remember how I found it. For this I’m truely sorry ?. However I really recommend Caseificio 4 Madonne – it’s very easy to get to, very close to Modena and not too far from Parma. If you want to try a different place, nearer to where you are staying, I’m sure you could email them to ask. 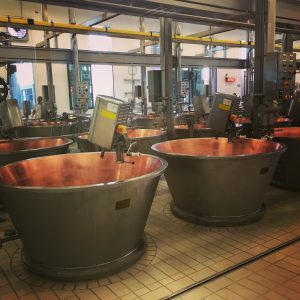 Here is a handy list of balsamic producers You will need to click through to their websites and contact them to make sure they do a tour/talk and tasting. I haven’t yet done a balsamic tour (I plan to!) but here is a super useful blog about arranging a DIY trip.